When should I introduce whole milk to baby? Whole milk is traditionally introduced at the first birthday. There is nothing magical that occurs on that very date, but this is a good time to anticipate introducing whole milk. If formula is running low or the mother needs to stop breastfeeding due to supply issues or other factors, whole milk may be introduced a couple of weeks early. It is also fine to delay the introduction of whole milk by a couple of weeks. How do I introduce whole milk? Some children have no issue taking whole milk right away. Other children require more of a weaning process. 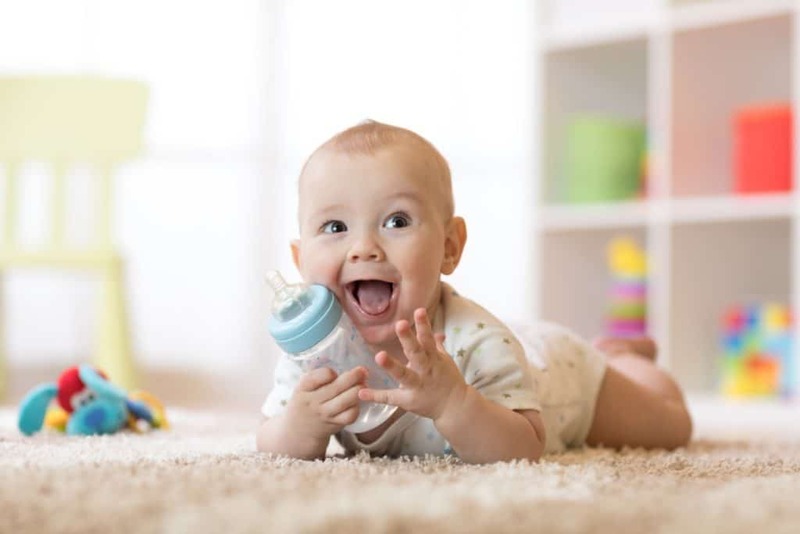 Weaning is simple in principle (but not always in practice), and just involves adding in some breastmilk or formula to whole milk until your child is used to the difference in taste. There is no exact percentile, however, the goal is to add less formula or breastmilk into the mixture over time. Whole milk can be warmed if you think this will help your child transition to enjoying whole milk. How much whole milk does my child need daily? Children should receive between 16-24oz of whole milk per day. Greater than 24oz per day may cause tummy troubles and other problems including constipation, poor appetite for solids, or low iron levels (anemia). If you have been introducing whole milk for over one month and your child is still not taking at least 16oz per day, please discuss this with a medical provider at the one-year visit or call the office to speak with a nurse if the one year visit has already passed. A child should receive whole milk only until his or her second birthday unless specifically directed by a medical professional. Once the child is older you may introduce other types of milk with less fat and less caloric value (like 2%, 1% or skim milk). Whole milk is fine to introduce to children who do not have any medical condition or allergies that would contraindicate giving dairy. If your child has an allergy to dairy, milk choice should be discussed with a medical provider. Other types of milk (almond, coconut or rice milk) may not have the fat, nutrient or vitamin content necessary for a growing child. Is organic milk better for my baby? Buying organic is a family choice. Theoretically, grass fed cows may provide more omega-3s in milk, but there is no evidence-based practice that shows only providing organic whole milk is better for the child. Should I be worried that my child is lactose intolerant? Lactose intolerance is exceedingly rare in children less than two years of age. Infants are born with lactase in the gut and infants with lactose intolerance typically have severe diarrhea, dehydration, failure to thrive and are often admitted to the hospital. Does whole milk cause constipation? Whole milk can initially cause constipation in some children. Make sure not to exceed the limit of 24oz of whole milk daily and include a diet high in fiber as well as other sources of hydration like small amounts of water. Have a question not covered by FAQ? This is a great topic to discuss at your child’s one year well visit. Non-urgent messages may also be sent to the office via Follow My Health online health portal. Do you need some additional resources?